May | 2014 | Every good thing…. Facing the music and finding a reason to dance.. I guess it is time to face the music. We will be very fortunate if the Bell sails before September. I Took this week off from turning wrenches on the motor. I needed a break. I can say it is not really a surprise what I found last Saturday, just that I am glad we had the motor failure before placing it on the boat. I went to the local Dollar General and purchased 3 butter knives for $1, to be used to shim the head so I could remove it. After removing and inspecting the head I found I had broken a valve thanks to my using excessive force with the pry bar. Broken valve at bottom of picture. 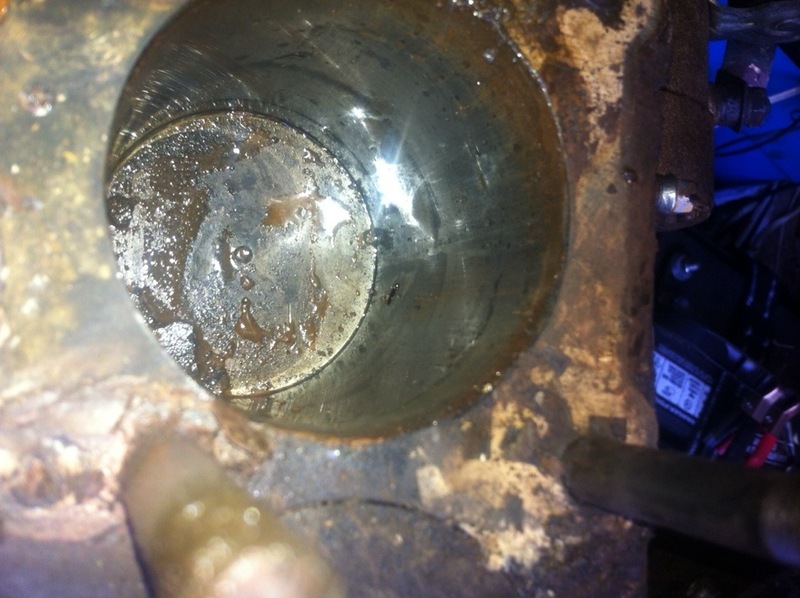 After examining things I could not find the source of the water coming out of #3 cylinder but there was evidence of water there, just no apparent gasket failure or crack. 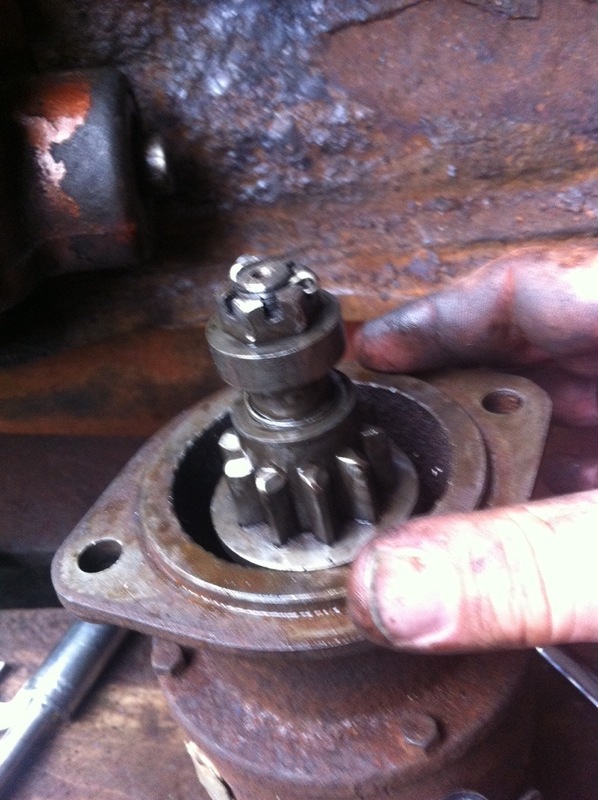 I then proceeded to turn the motor with a big spanner on the output shaft. Sure enough I found the leak in #3. If you look at the photo on the right hand cylinder wall there is a black spot. That spot is a hole. The water jacket side of the cylinder was so corroded it blew out. Causing the water leak. Inquiring online and at the boatyard the consensus it I should take this motor to the Stradley’s Machine shop on Main street in Titusville. The re-sleeve will cost roughly $500 and possible another $250+ for new pistons and rings. The good part is we will have basically a new motor when done, the bad, aside from cost, is I have to tear down the motor to a bare block for them to work on it. 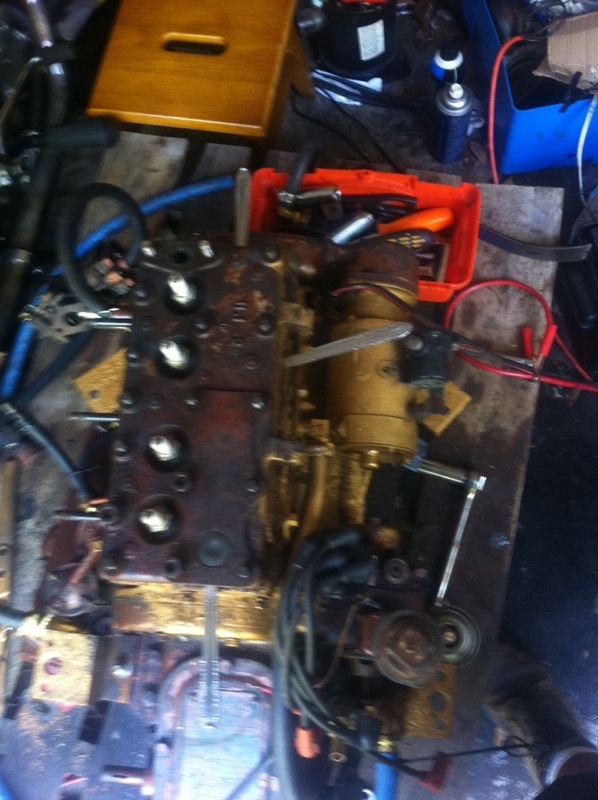 I will start by next week, everything has to be removed, studs, valves, crank, pistons. A lot of work. Lori bought some cushions last week for the Bell. 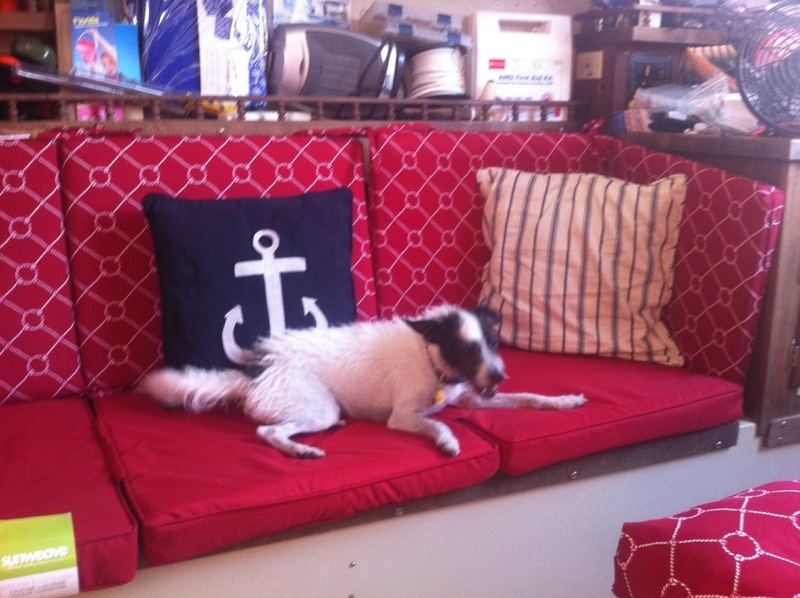 She purchased them at the Christmas Tree Shop for a fraction of the cost of “Marine” custom cushions. The fit well and tolerate moisture , UV and stains as they are for patio furniture. 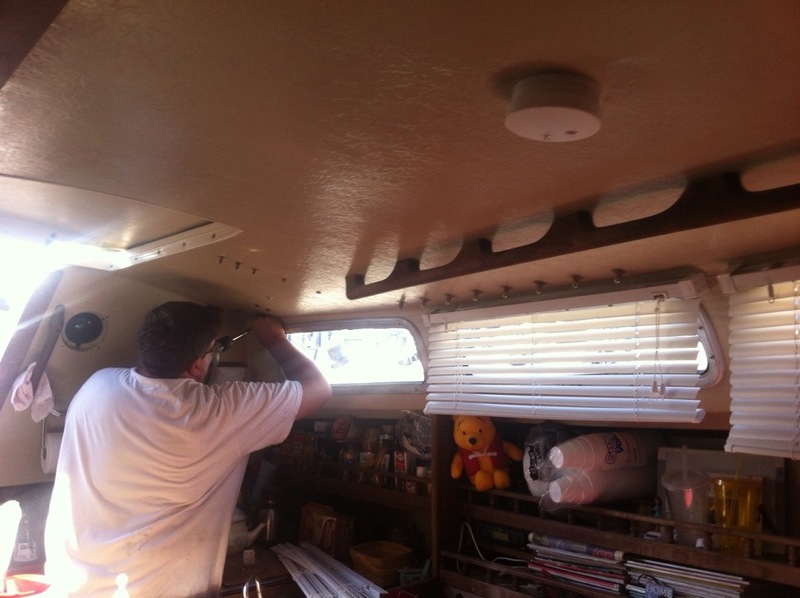 We also installed the rest of the Mini blinds, a project we had started last year when the Bell was still in the water. 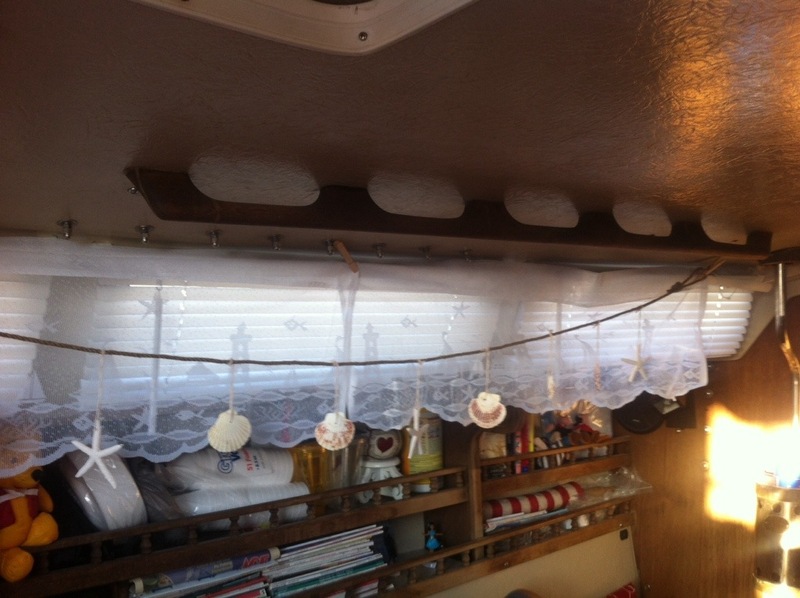 Lori also purchased LED string light that are solar powered, they give a good mood lighting to the cabin and don’t even draw on the main batteries. We stuck the small solar panels behind the forward most blinds. The setup seems to work well as the panels are not even noticeable. 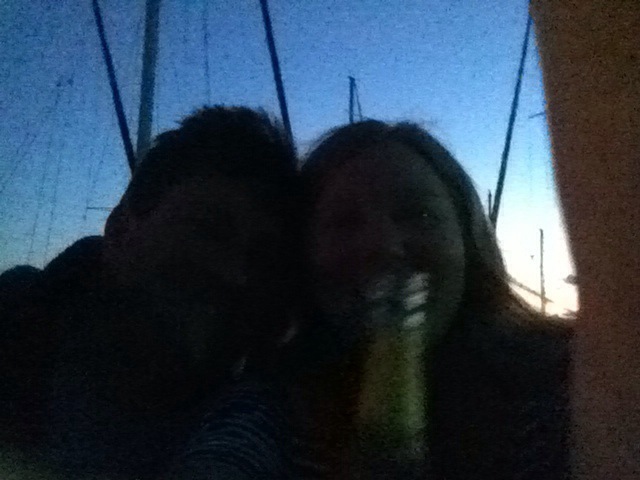 Before leaving the Lori Bell last Sunday Lori and I took a bottle of champagne up onto the cabin top. It was twilight an getting cool enough that I had to wear a sweet shirt. We poured ourselves each a small cup of champagne and said a prayer asking the Lord to bless the Bell and all who sailed on her. We drank our portions and gave the rest to the water. The entire evolution was quite enjoyable, romantic and traditional. Lori and I have been very busy with multiple other project besides the Bell that a quite a bit more important to both of us. We did do a push to get her done but we are not quite there yet. We have discussed it at length and we are grateful for the chance to work on her and get it right. However we are more grateful we have good friends and family we hope to share her with in the future. Every day is a blessing and we wish to share our days with others, that is part of the reason for getting a bigger boat and all of this work. For all of you who follow this blog and have supported us in all we are working on accomplishing here and elsewhere Lori and I offer our heart felt thanks. After Church last night we visited Walmart to get some champagne and a paint roller. Why you ask? So we can put the Lori Bell back in the water. We rose early this morning and I dawned my painting garb and gloves ant waited for the lift to appear. 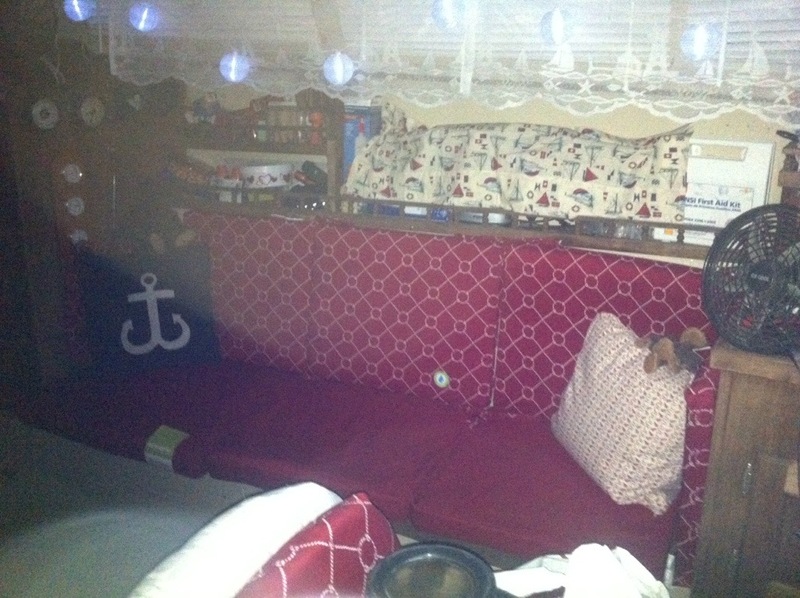 Once on the lift I had to scramble around with the roller and touch up the bottom under the stand bunks. And then she was off to the water. We move to head her off at the pass and record the events..
My fiddling below at the end there is to check for leaks with all the work we had done. Before pulling off the harness they like to know she will not sink. 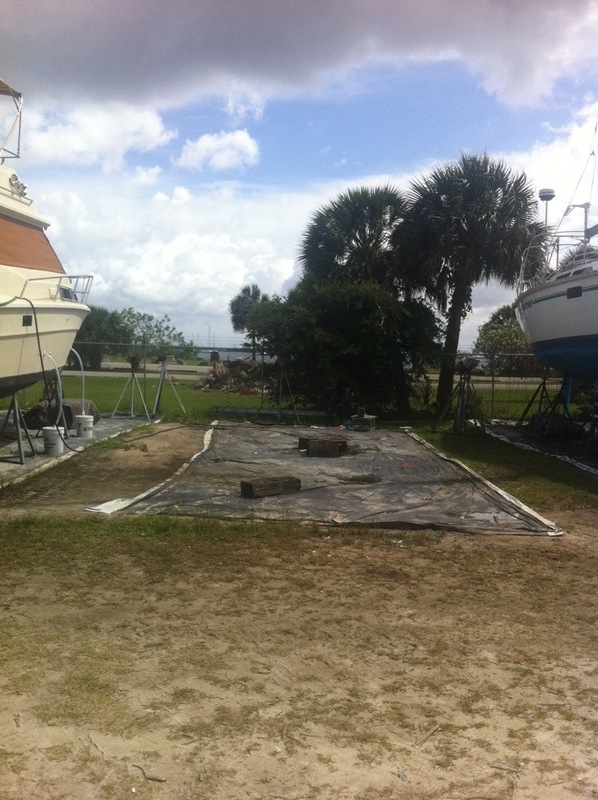 Our neighbor put his boat in and had a seacock left open with no hose attached. He found it unsettling having that much water filling his boat, it had been on the hard for five years. 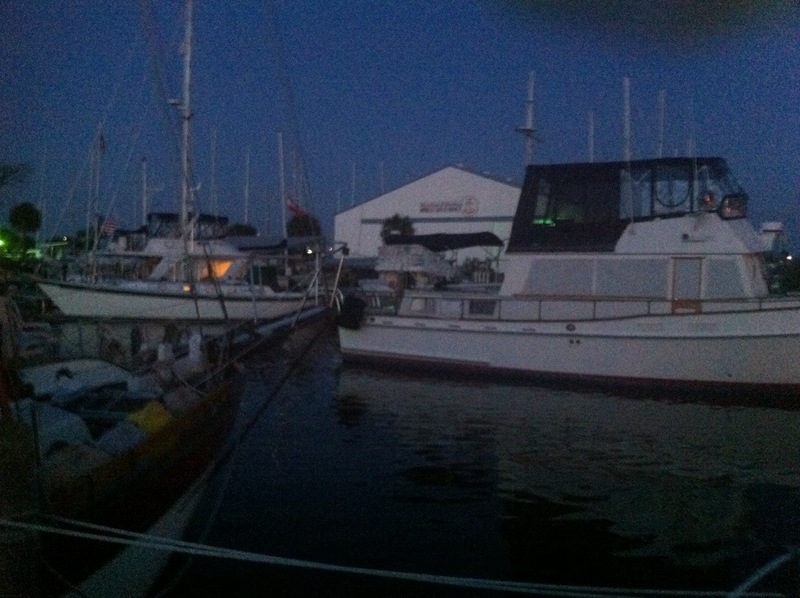 After we had her in the water we pushed her into her new slip next to our old neighbor. After that we returned to our now empty spot and gathered what was left of our stuff. 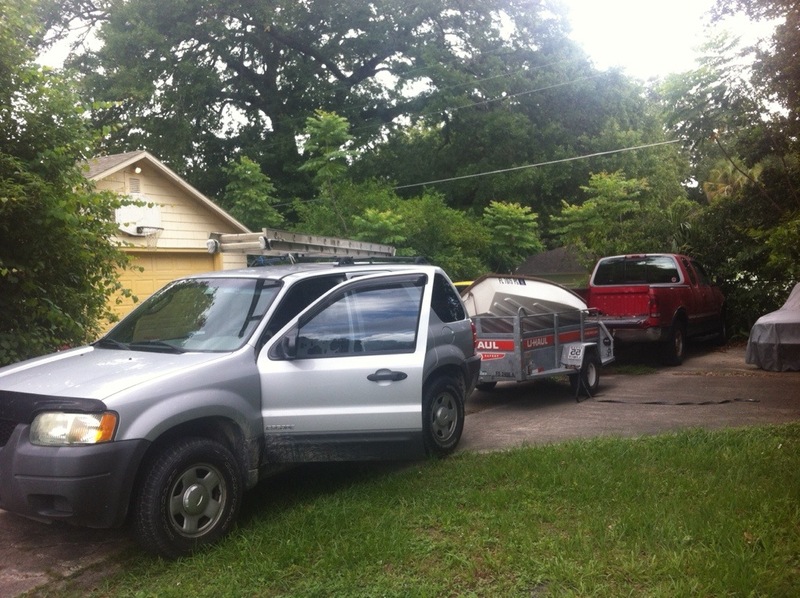 We loaded up the trailer with our dinghy and the ladder and take it home. 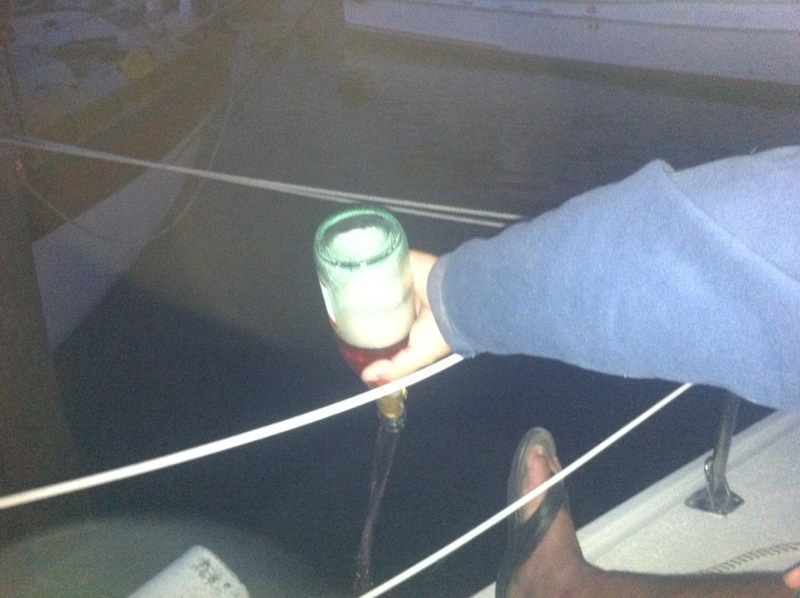 We forgot to christen the boat with the champagne, oopppss, well there is always our next trip. 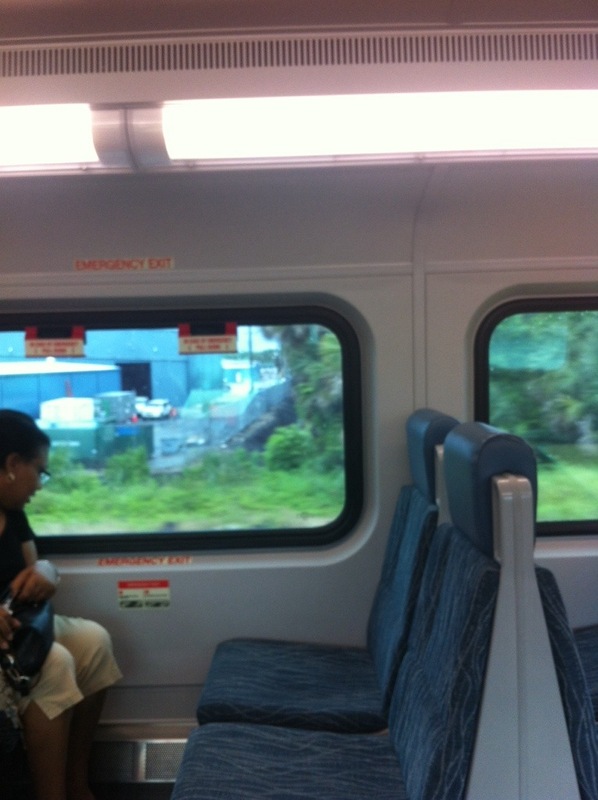 Lori and unloaded and returned the trailer and decided to take a train ride on the new SunRail. It is free thru Friday. 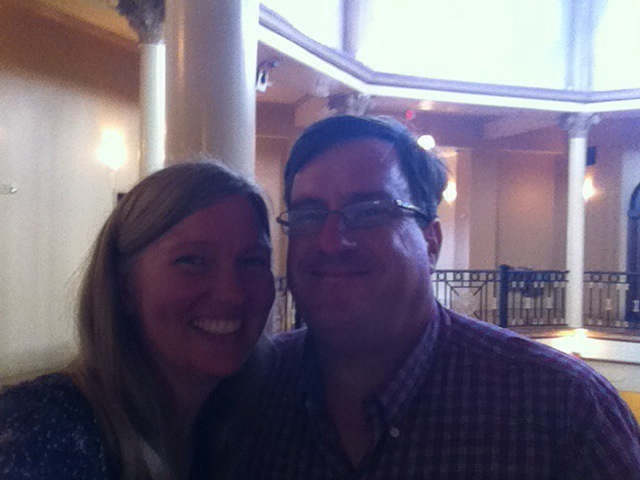 We road it down to Church Street Station, were Lori and I met each other 22 Years ago. 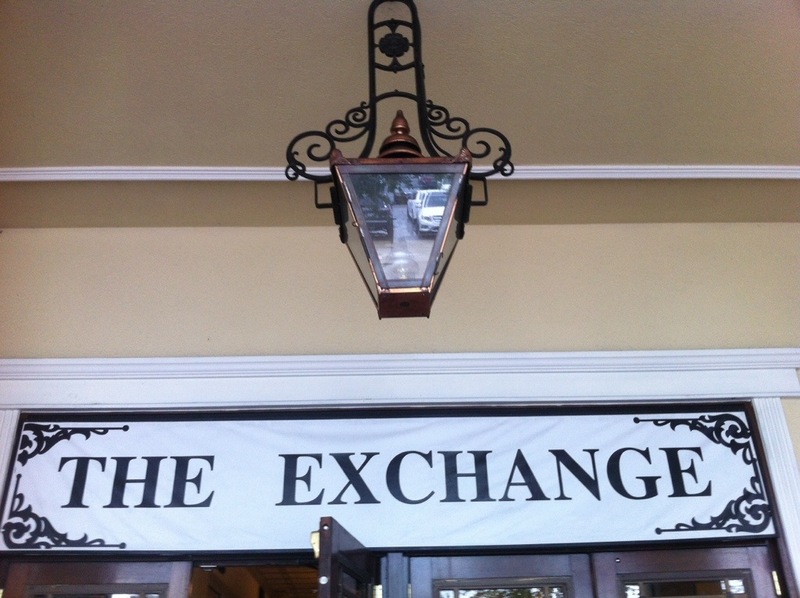 We stopped by The Exhange, were we met on the 3rd floor. Lori and I standing on the spot we first met. After that we went and had dinner at a Tiki Bar on Wall street. 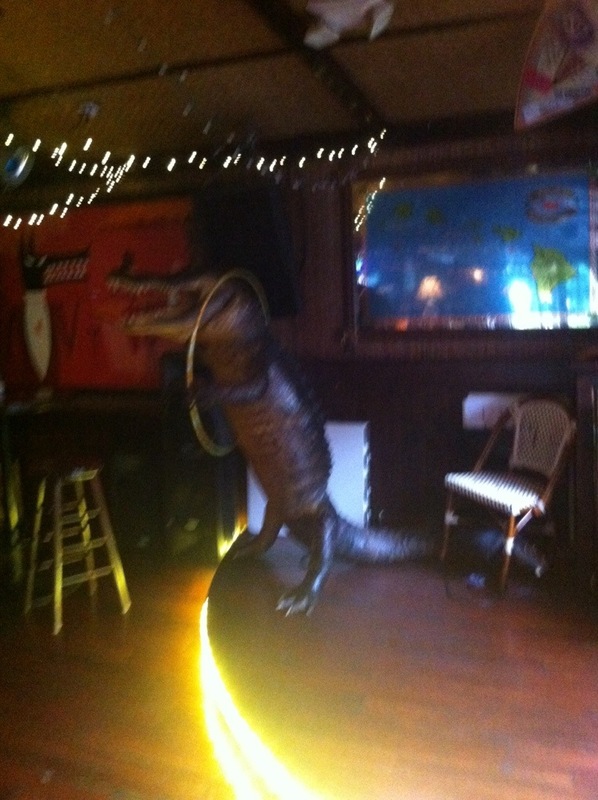 They had a neat gator, stuffed. After that we road home. 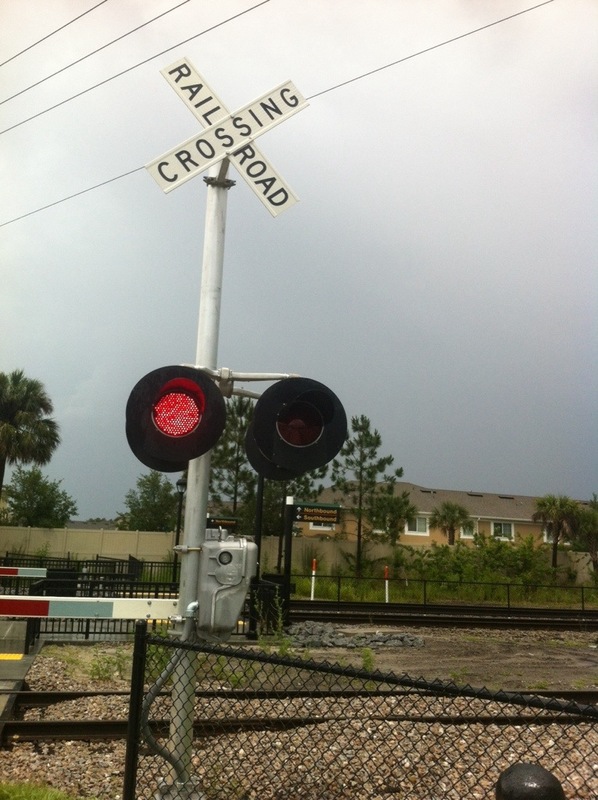 Love the SunRail, so easy and no stress of traffic, we will be riding again. We got out name on this weekend. Pretty easy compared to all the other things we have done. We ordered our letters from ebuysigns.com out of Lake City, Florida. 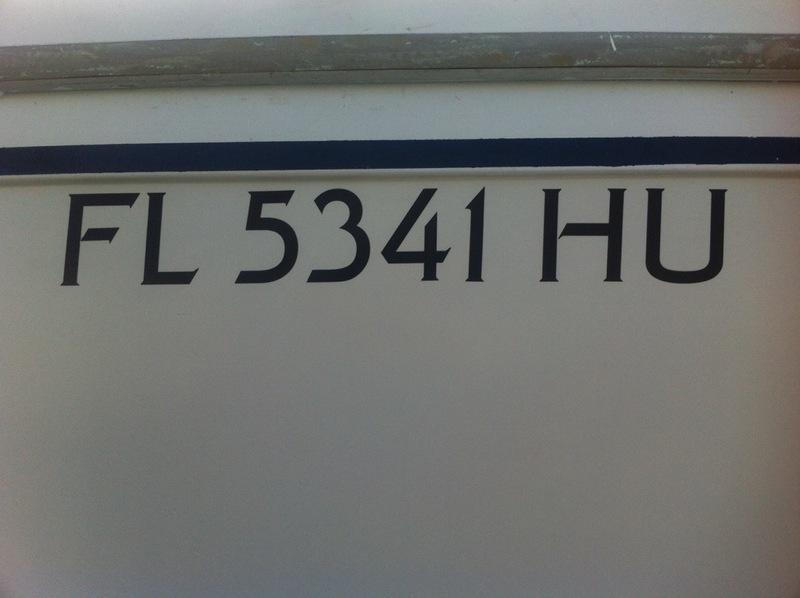 The transom is Celtic lettering and the registration numbers are Final Frontier. We ordered the Reflective Navy but they do not reflect all that much using a flashlight. 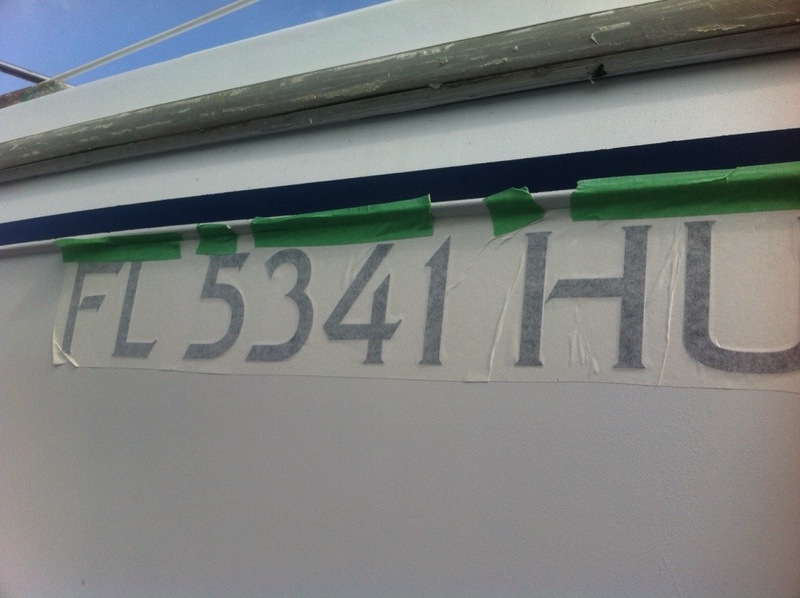 After cleaning the hull as best we could we taped the decals still in their papers to the hull using painters tape. 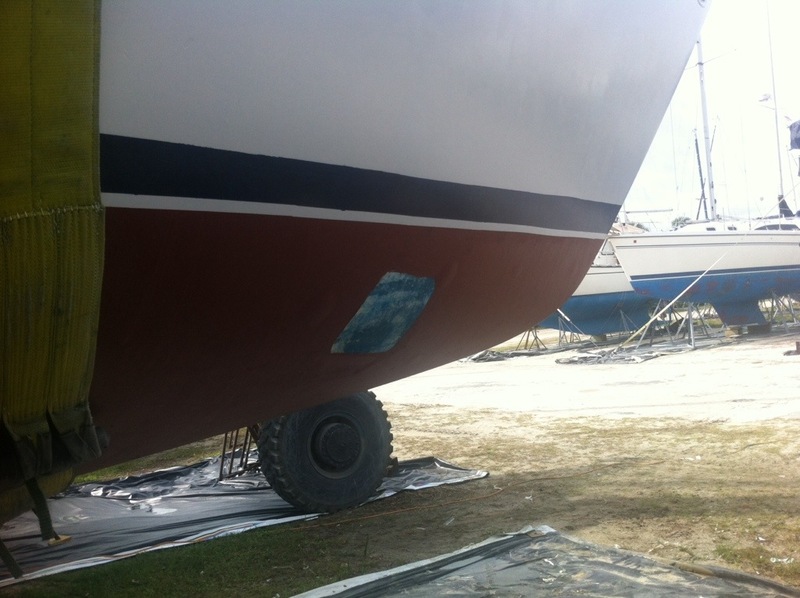 Here is a video of the pealing away of the transom. All the decals were about $127 delivered. We are very happy with them. We also did some prep work last weekend for the motor. 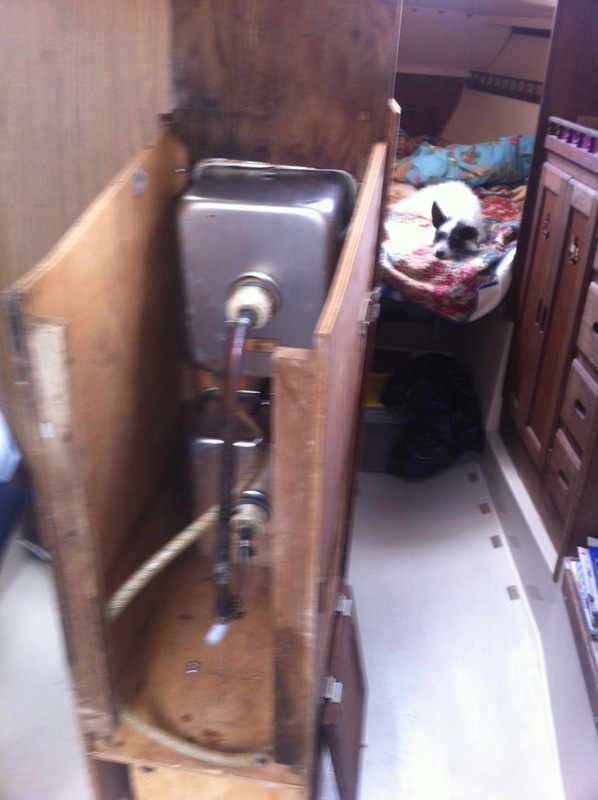 This included removing the bar with the sinks and the gimbled stove mount. We stood the bar up to allow the motor to be dropped into the bay, in which I finished prepping and installing the engine mounts. Galley bar standing on end. Engine bed with mounts installed. We received the new manifold for the A4 from Moyer Marine pretty quickly (Friday as promised by Ken). I installed it yesterday (Monday) and after fixing an oil leak at the base of the fuel pump and finalizing the motor mount brackets (gold wings visible in the following video) we ran her up. 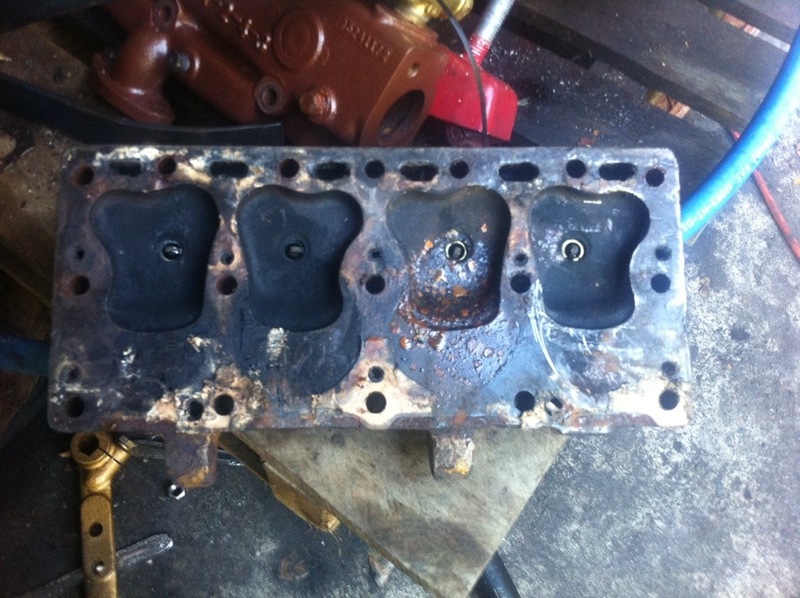 Unfortunately it appears that water is blowing out the exhaust port of the new manifold. It is also flowing out the exit hose atop the manifold like it should, however the exhaust should be dry. We may have received a bad casting, I will have to leak test it in the sink tomorrow before calling Moyer for a replacement. She ran with a dry exhaust last week with the non flowing manifold so I think the head is fine. I finally was able to get the motor to idle. I appear to have a failed exhaust manifold that requires replacement. Our new manifold should be here by Monday. 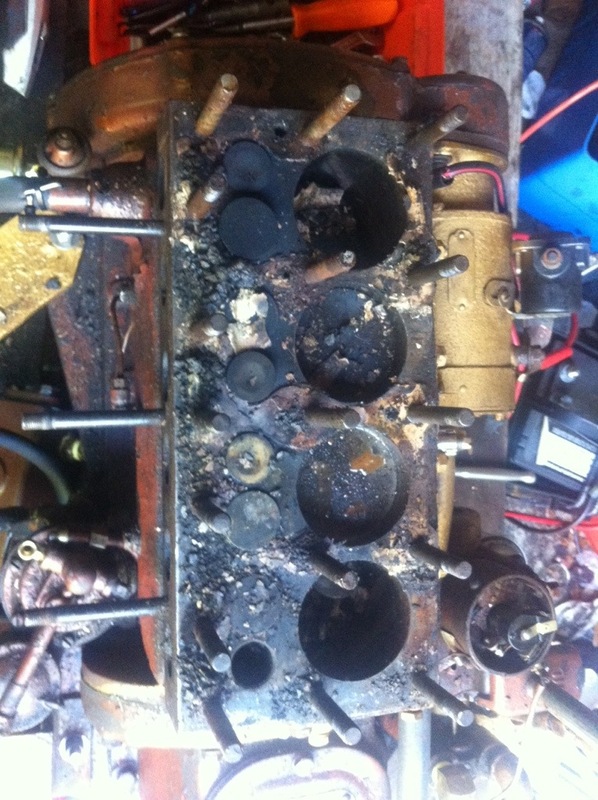 The old one was cracked and exhaust gasses were flowing through the water jacket. We now have new letters for naming the Bell. This weekend we will be putting them on , hope they look good. 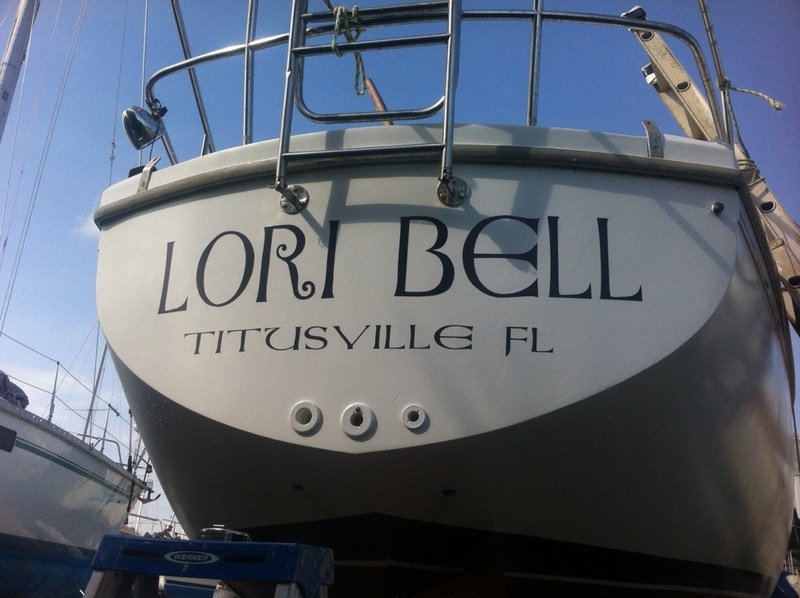 Next Friday, the 16th, at 9am the Lori Bell should be back in the water. We have a busy weekend ahead. Lettering, finalizing the motor mounts, upgrading the automatic bilge pump, wiring in the bilge blower and starting on the motor wire harness. Add to the list a friends graduation party and mothers day dinner and our schedule is pretty full. 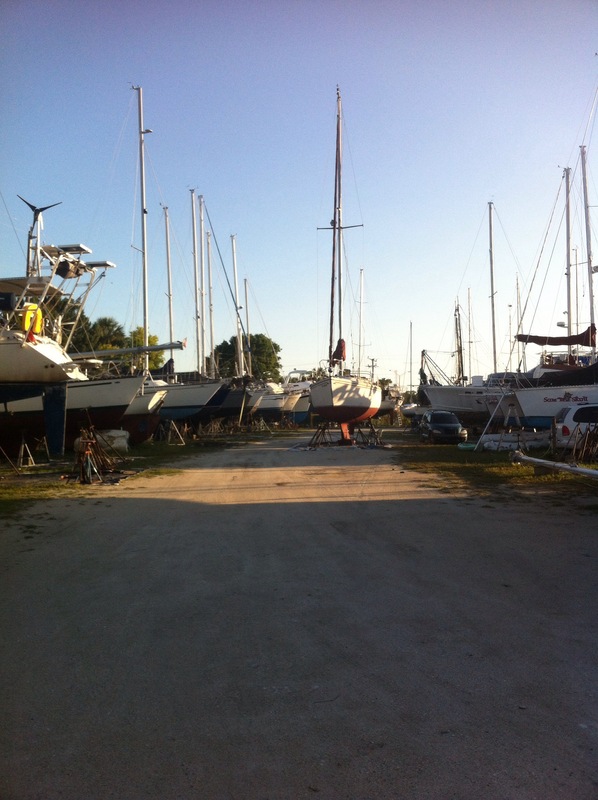 We have started to order parts for working on the mast. 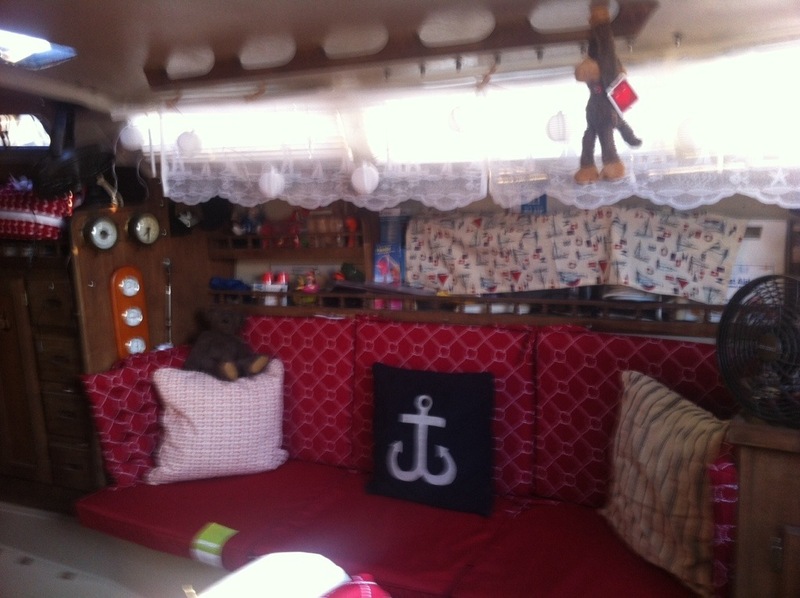 I stills need to get a backstay flag halyard and a pennant halyard for the spreader. Spoke with Dennis the rigger, once I get the mast painted he said they can rerig and restep in one day. I just need to call him. I would really like to get it done before June but may run out of time. The thought is to go full time on mast work after next Friday. 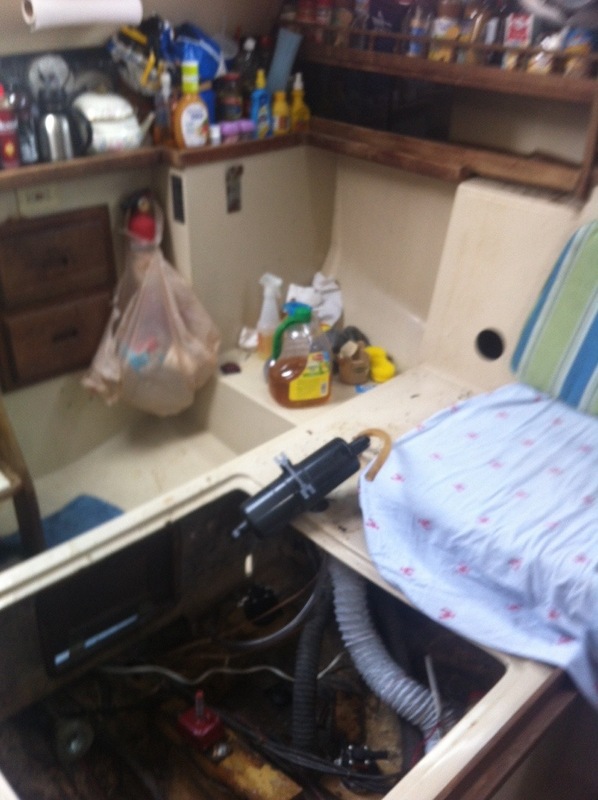 Once we get her rigged we can sort the motor, companionway doors and cockpit floor out. It will be tight to get her sailing by July but all we can do us try. 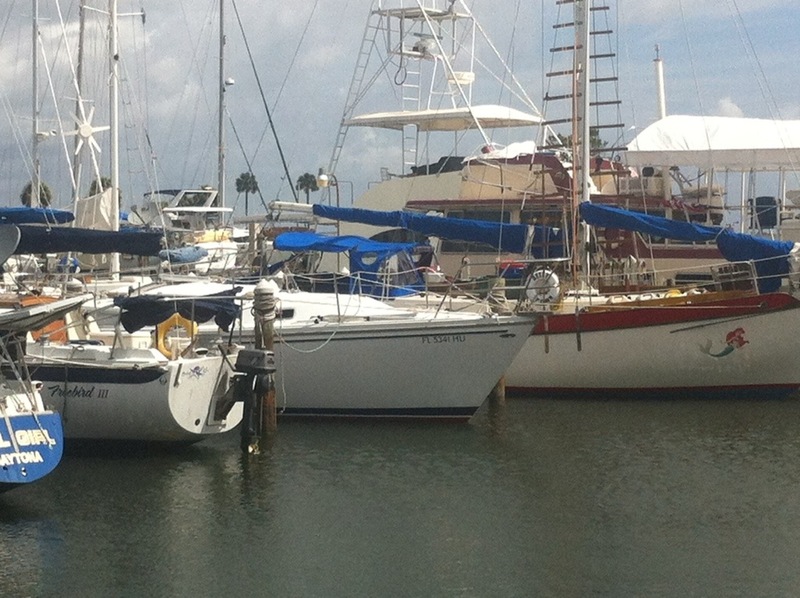 I leave you with this photo of a C30 that sat about 6 boats down from us. Talking to the owner he said her last owner had been transferred out of town and put her out on the hook to save money. She split her line and ended up on her side in the mud for 4+ months. 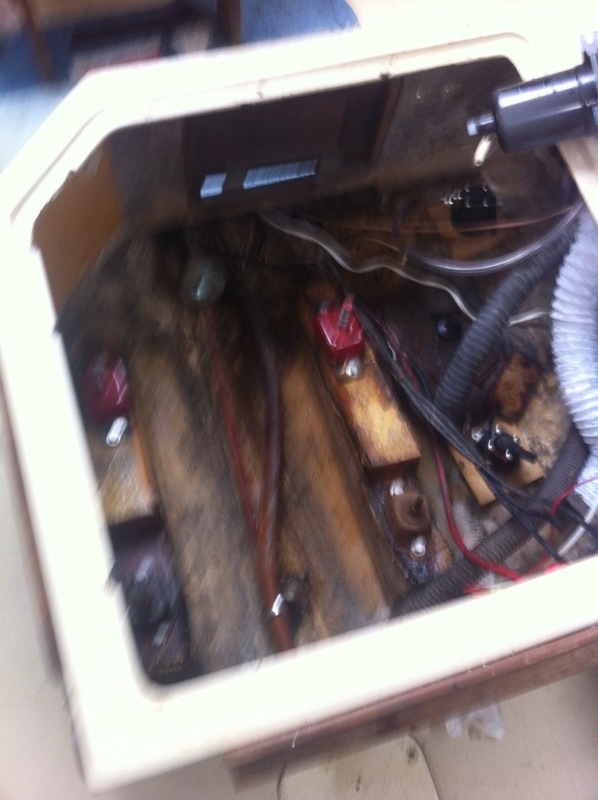 Suffice it to say her interior wood work and motor are shot due to water damage. He got her for a song. 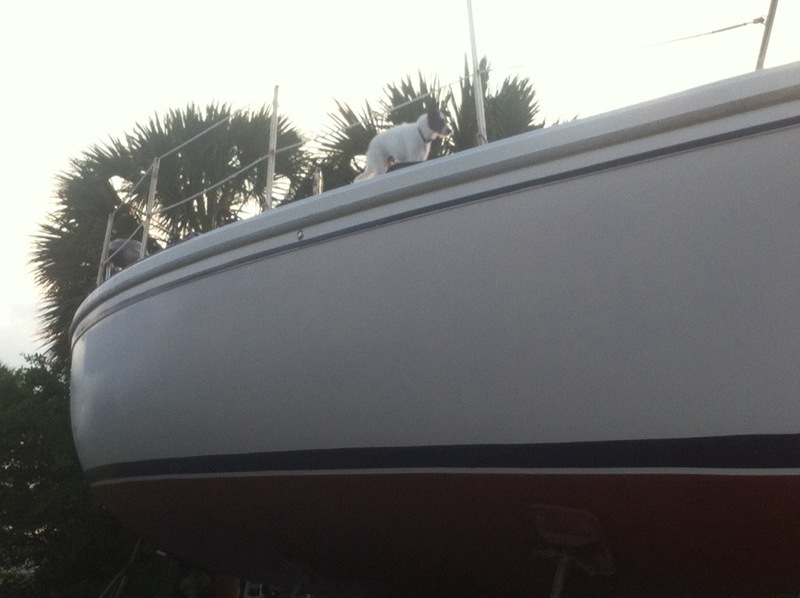 I noticed that her keel seems about 8 inches shorter than ours, like someone cut her down. Not good, I did not mention this to the owner, he has enough on his hands. The boatyard moved her out of her spot, sitting here here in the middle of the fairway. 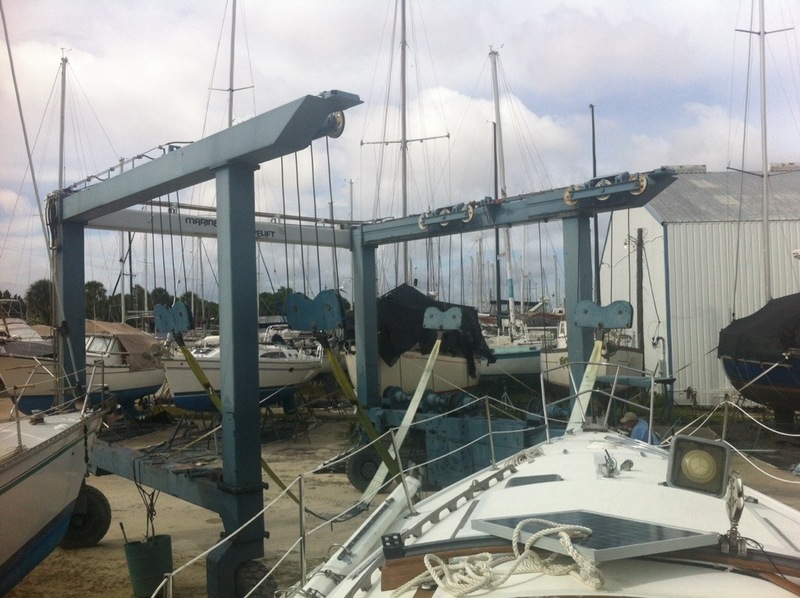 Now a catamaran sits stored were she was and her owner has an outboard strapped to her transom. I wonder if she still be there this weekend. Shaft logs and other bits, plowing forward. Finally finished scraping the painters tape of the rub rail today. She looks pretty good and is ready for her decals. We were hoping to apply them this weekend but they have yet to arrive. The online vendor I purchased them from shows them as shipped Thursday. Finally today I installed the new hose for the shaft log. Purchased from Defender it is 1.5″ ID hot exhaust hose without wire. The above is important because I ordered the overpriced hose kit from Catalina Direct. They sent me a 1-5/8″ exhaust hose. Too large to clamp down on our shaft log and stuffing box. 1 week lost waiting for the next hose. I ordered the proper Buck Algonquin hose to fit. 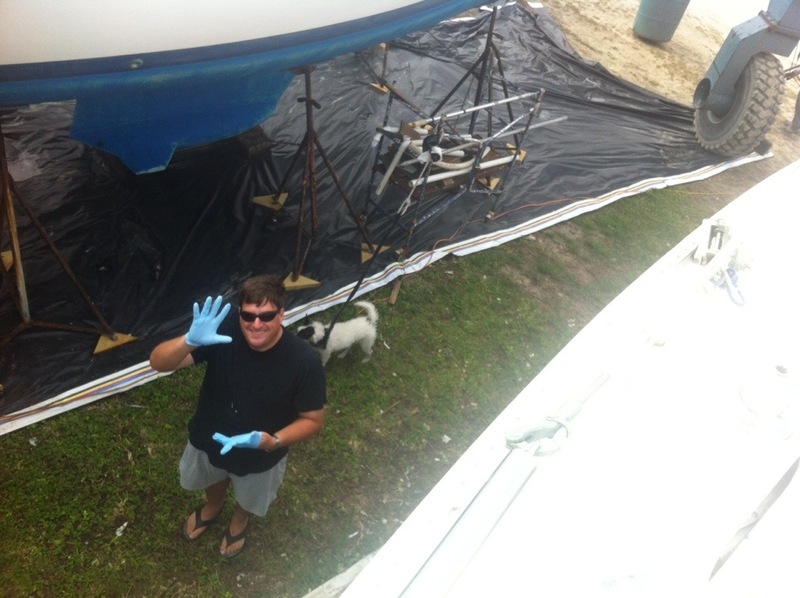 It turned out that with 8 layers it would not fit into the tapered space between the shaft log and the hull, a problem specific to a Catalina 30. I had to order the thinner exhaust hose. Another week waiting before this weekend and I was finally able to install the hose. After that I put in the stuffing box and installed 2 wraps of new packing. In the morning the plan is to put the coupler on the shaft and using my handy jig install the motor mounts on the rails. Then we will be ready to install the motor. 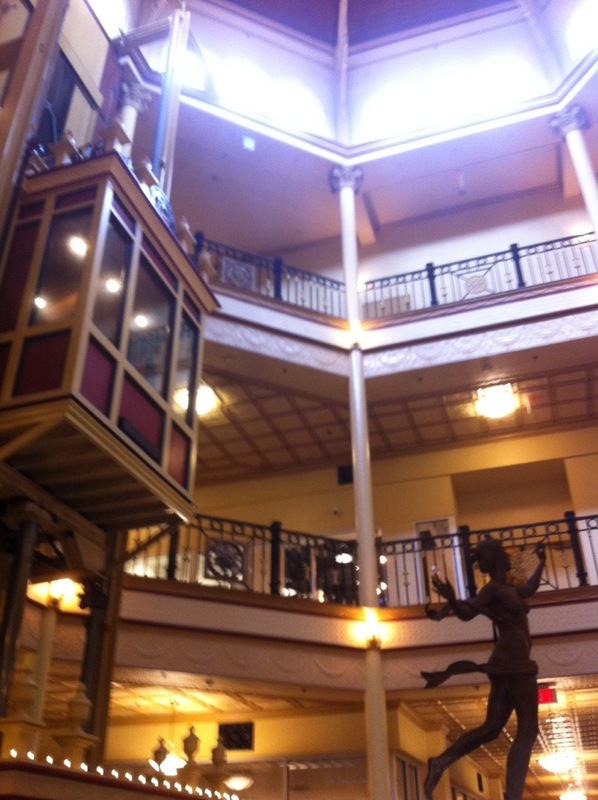 Had someone look at the Clew last week. We thought she was sold but they backed out. Sunday afternoon we will be showing her to another buyer, here is to hoping. The plan was to drop the motor in next week. However I have had some fuel issues with it. One problem is I am using my motorcycle gas tank and it happens to be full of ethanol laced fuel. The ethanol ate the gasket on my fuel bowl. As I did not want to wait a week I made a new gasket out of a sheet of gasket material I bought at NAPA. Following the replacement of said gasket (it caused the fuel pump to loose prime and starved the carb). I went to reinstall the copper fuel line to the carb from the pump. It turns out one of the brass fittings was stripped. I should have guessed as it was a compression fitting and the previous owner had wrapped the thread in Teflon tape (tape on a compression fitting does nothing). A quick trip to Ace Hardware and I was back in business. I then discovered that all my upstream work had loosened some ancient crud in the fuel lines. 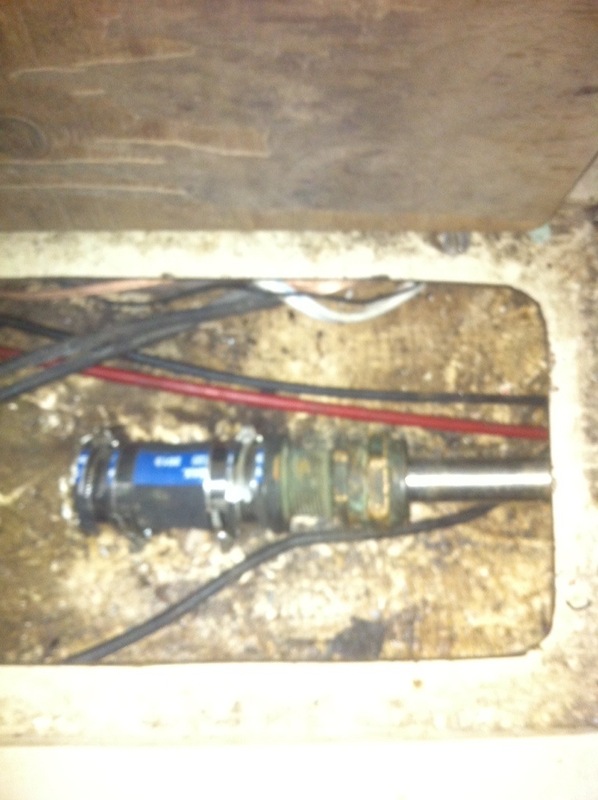 Now the float for the carb is stuck open, causing fuel to flow out the air intake. I need to pull the carb and clean it one more time. Next week I hope I can get these issues resolved and get her to idle nice so we can install her in the Bell. 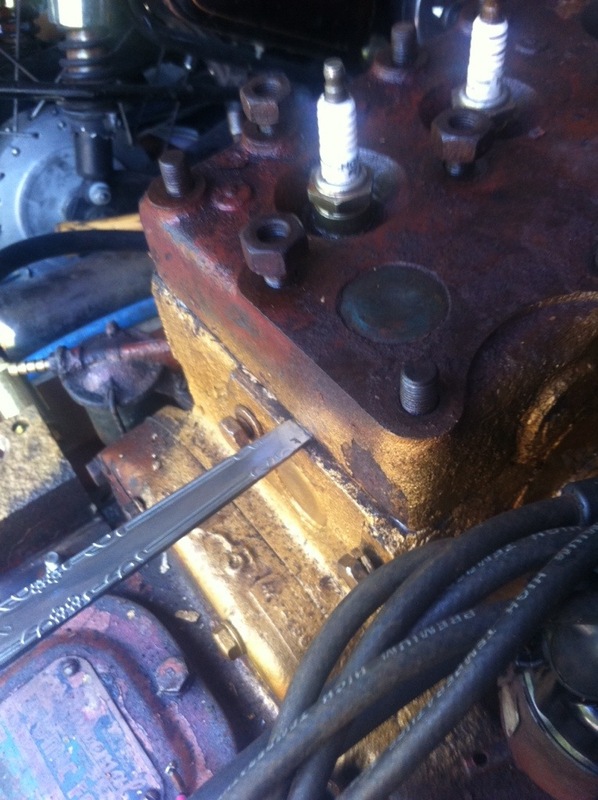 Oh, I forgot to mention that while I was dealing with the fuel issue the bendex on the starter jammed up. I had to pull it apart, clean, lube and reinstall. You have to love antique motors.